As I noted in my recent post about Ovid, he spent the last decade of his life in exile in Tomis, on the Black Sea, Constanța in modern Romania. As noted by Garth Tissol in the introduction to his commentary on book one of the Epistulae ex Ponto (the text I assigned my students), Fitton Brown has argued that Ovid, in fact, never went into exile, and it’s all just a literary fiction. One of the main reasons it has been argued that Ovid stayed at Rome and wrote the Tristia and Epistulae ex Ponto as an exercise in poetic wit, has been his use of hyperbole. Tomis is not nearly so bad as Ovid makes it to be. Most people reject Fitton Brown’s argument. Indeed, it strikes me that Ovid’s hyperbole is, in fact, true. Or rather, it is true to him. The Roman province to which he was exiled was called Scythia Minor. Ovid portrays his place of exile as Scythia in the worst possible sense. Ancient Scythia is, essentially, Ukraine. For an idea of what the weather in Scythia can be like, Saskatchewan is the Ukraine of Canada. Ovid’s literary Scythia is a place of unending winter and deep gloom. Think of an Italian in a six-month Saskatchewan winter. The inhabitants of Ovid’s Scythia are, inevitably, Scythians. Scythians are archetypal barbarians. They are the sort of people who drink wine from their enemies’ skulls. In Ovid, they are always engaged in war. Warfare is so continuous in Ovid’s Scythia, he can’t even plant a garden and is always girded for battle. We look at Tomis and say, ‘It is not unremitting winter! The weather is not all that bad.’ It is, after all, on the Black Sea coast. The summers are not bad, and the sea has a tempering effect on the winter. This isn’t the Scythian plain. Moreover, even if there was some battling, it was not all war all the time for an entire decade. To read Ovid this way is to miss the point. Why would we read a poet for an accurate, historicist picture of the scientific details of climate and battles? We read him for his artifice, his wit, and his soul. Read the letters from Pontus. Ovid is miserable. Sure, it may not really be a Gigantomachy as he imagines it. He may not be Ulysses. But it sure feels that way. The winter’s not as bad as in, say, Regina, but it’s still pretty bad for a guy from central Italy. The battles may not be endless, but for someone from Rome in the midst of the Peace of Augustus, one battle is more than enough. Not only this, but it is the winter of Ovid’s soul that matters, isn’t it? It is the battles waged against his heart and memory. He has been taken against his will to a place he did not wish to go. This is the real heart of the Tristia and Epistulae ex Ponto. I do not think anything but hyperbole will bring that across. Who tempers his sorrow with accuracy and reason when lamenting to his friends? This entry was posted in Ancient World, Books, Classics, History, Literature and tagged black sea, constanta, epistulae ex ponto, fitton brown, garth tissol, hyperbole, letters from pontus, ovid, romania, tomis, tristia on November 28, 2018 by MJH. I recently finished teaching Ovid to both my classes. In fourth-year Latin verse, we finished up my chosen selections from his Epistulae ex Ponto (letters from Pontus), and in Latin epic we finished A. D. Melville’s translation of his Metamorphoses. In my undergrad, I read only a few Latin poets — Virgil, minor authors associated with Tibullus, and Ovid. The Ovid I read then was his Ars Amatoria — the art of love. Ovid is a great poet, and if you are Latinless, A. D. Melville is a great translator of Ovid. Depending on your personality, you’d best start either with The Love Poems or The Metamorphoses. Ovid himself started with the love poems — the Amores, themselves full of wit and charm and amusement, executed in brilliant elegiac couplets. This was his favoured metre — the first line of each couplet is a dactylic hexameter (the metre of epic), the second line has had a foot stolen by Cupid (technically called a dactylic pentameter, and that’s all we’re saying about metre today). He played with all the conventions of Latin love elegy, and went on to his Ars Amatoria in that metre as a way to produce a mock-didactic poem about how to pick up the ladies, with a section for ladies to pick up men. Sometimes he gives opposite advice. Men — make sure you see her in daylight to make sure she’s really pretty; sometimes lamplight covers up blemishes. Ladies — make sure he only sees you in the lamplight, it covers up blemishes. Apparently chariot races are also a good place to find a date. Poets who are always testing and stretching their art are not comfortable with staying still, however. Thus Horace ranges through as much lyric as he can before moving to satire, and thence to the invention of Latin verse epistles. Ovid takes his love elegy and transforms it with his own first foray into mythology and the verse epistle with the Heroides. If you know classical mythology, I very strongly encourage you to read the Heroides. These are letters from the women of myth to their men, mostly complaining about their ill-treatment. Cutting and vibrant, they create a voice for the too-often voiceless characters of classical verse. Ovid’s next two forays into myth were simultaneous — why stick to one thing when you can do two? The famous Metamorphoses, the epic that defies convention, and the Fasti, a work that could be said to be at least inspired by HellIenistic models, a poem in elegiac couplets that goes through the Roman calendar and gives the myths and legends surrounding their foundations. Two different approaches, two different tones, pure Ovid. If you know a ‘Greek myth’, there is a very good chance that you know it from Ovid’s Metamorphoses. For example, we have no pre-Ovid version of Narcissus and Echo. 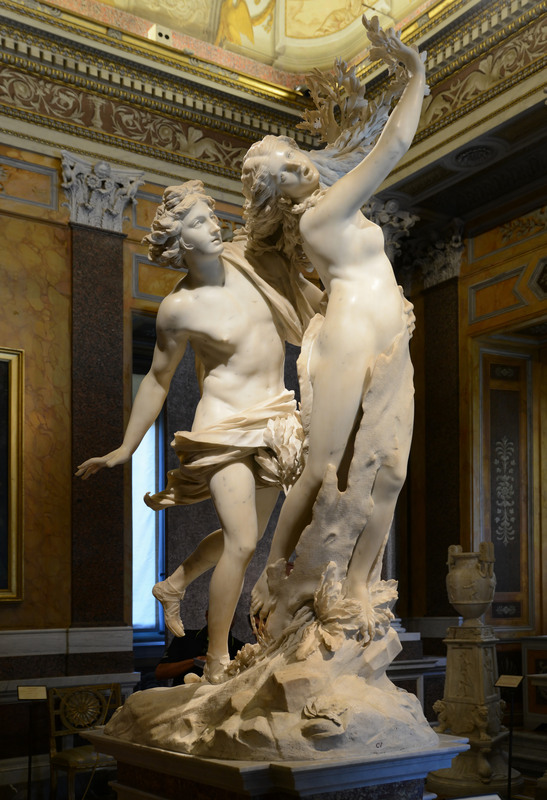 The version of Apollo and Daphne we all love, or of Pygmalion, or of countless others, is the version as recounted by Ovid. Ovid’s main concern in the Metamorphoses is not simply to recount myth after myth about 250 times in almost 10,000 lines of dactylic hexameter. If that were the case — shoot me now. Rather, it is to use myths, and myths of metamorphosis in particular, to plumb the depths of the human soul to bring out the psychology and suffering and pathos of every sad myth, and cry out against the injustices of the gods. Ovid soon had cause to cry out against Jupiter — as the poets called the first emperor, Augustus. He found himself exiled for a poem — the Ars Amatoria — and an error. We don’t know what the error was. Off he went to Tomis in Scythia Minor on the Black Sea (modern Tomi, Romania). Was it as bad as he says in the Tristia and Letters from Pontus? I think it felt that way to Ovid — what more can we ask of a man? He died in exile, despite his many letters and poems sent home. His verse coruscates with device, artifice, wit, and cleverness. He is perhaps too clever for his own good, bringing down the censure of Quintilian and the English Augustans (18th century). Not only that — he’s fun! And we all know serious literature cannot be fun, of all things. This brief encomiastic run-through of his poetic output scarcely does him justice. If you’re looking for a new poet to test out, if you want to test the waters of classical verse — try Ovid. This entry was posted in Ancient World, Books, Classics, Literature, Mythology and tagged amores, ars amatoria, augustan poets, augustus, epistulae ex ponto, heroides, metamorphoses, ovid on November 13, 2018 by MJH.